I am a small town Missouri photographer who is obsessed with coffee, my dogs and a desire to travel the world. Rent The Runway – This is a great option to get a stunning dress for a fraction of the price. They have so many great options! Amazon – There are some great skirts and maternity dresses. 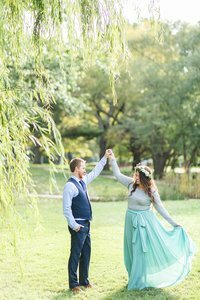 I wore this skirt for our anniversary photos as well. To be honest, I love it so much that I have it in two colors. Men’s Warehouse – All the guys in our wedding bought their outfits from Men’s Warehouse, and I think they looked so dapper! This is another option for purchasing a suit as well. If you’d like to book your session or wedding, you can contact me at kelsey(at)kelseyalumbaugh(dot)com. Check out my Instagram @kelseyalumbaugh ! And like me on Facebook to see the latest blog posts. 🙂 If you’re curious about the investment, you can check that info out here, but please feel free to reach out so we can better address your photography needs. « Can I have the RAW files? Reasons why that answer is always no. I am a small town Missouri photographer who is obsessed with coffee, my dogs, and a desire to travel the world.